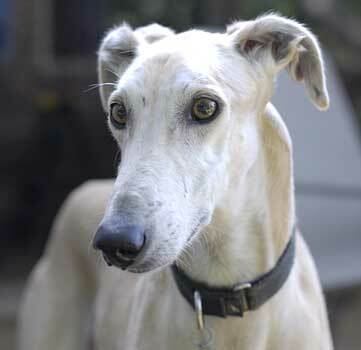 Blake is a light fawn male greyhound, who is approximately 2 years old. Blake has no tattoos, so his age is estimated. He was found running as a stray with Whitney. 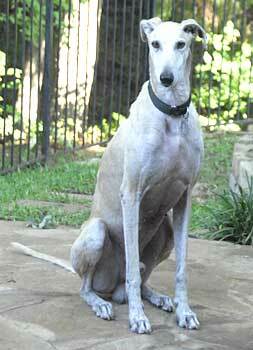 Blake, like Whitney, arrived with sarcoptic mange and several tick diseases, Ehrlichia and Rocky Mountain Spotted Fever. He has been successfully treated for all, and is now ready to find his forever home! Obviously nothing is known about Blake's past, but there is no doubt he is relieved to be off the road and living in a foster home. Blake lives with much enthusiasm and loves his human companionship. Blake was found as a stray. His origin is unknown to GALT and Blake doesn't seem to care either - he is just happy to be in a foster home and out of the elements. Blake came to us with severe skin issues. His skin was extremely inflamed and flaky. He was underweight and just seemed tired. We could tell he didn't feel well. With some good nutrition, care, and lots of love, Blake has blossomed into a beautiful boy. His fur has filled in, the skin issues have cleared up, and he has a bounce in his step. Overall, Blake is a very happy boy, and we can tell he feels so much better. Blake has a personality unlike any other greyhound I have fostered. We call him our "lab" because he sometimes will act more like a lab, than a greyhound. He loves laying on the hard concrete patio in the shade or on the cold tile kitchen floor. Blake has one of the most easy-going personalities. He has become very attached to his foster mom and dad - and will usually follow one of us around the house. Sometimes he will even anticipate our movements and will wait for us in a room that he knows we are about to enter, while other times we will find him just napping by himself in the office. Blake is a very animated dog, but in a very quiet way. He rarely barks - instead his ears will stand up and his head will tilt. Each morning he wakes up and stretches, letting out a very animated, verbal yawn. We rarely will see him laying down like a regular greyhound. He usually sits like a statue - he will sometimes sit like this for long periods just taking in everything around him. If he isn't sitting like a statue, he is curled up tight in a little ball on his bed. Blake is a very easy-going dog. He gets along well with his canine housemates. However, he is not cat tolerant. He caught on to the routine of the house very quickly and seems to be an extremely intelligent dog. We have discovered Blake knows how to open doors with lever handles (not round), so we have to be extremely careful to make sure every exterior lever-handled door stays locked. Once we came home to find him just sitting in the garage, waiting for us - he had opened the door in the laundry room to the garage. During the work day, Blake is either confined in the bedroom, or we give him full run of the house. Blake has decided he doesn't like the crate. He gets himself worked up while in the crate, so we no longer crate him. He has never caused any damage, nor has he had an accident while having full run of the house. When we return, we will often find him just sitting (in his statue pose) in the living room or office waiting for us. 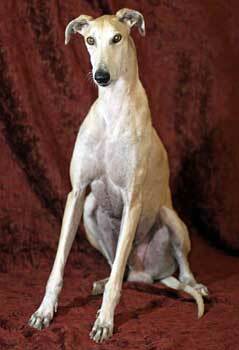 It's actually pretty funny to see a greyhound sit this often.